A koi pond can be a beautiful addition to any property; however, with the beauty of the pond comes the responsibility of caring for the pond and the living inhabitants. Unfortunately, there are a number of problems you may encounter in the day to day care of your pond, ranging from diseases to water problems. Knowing about the possible problems you may encounter will help you effectively treat the problem and return the pond to a healthy state. 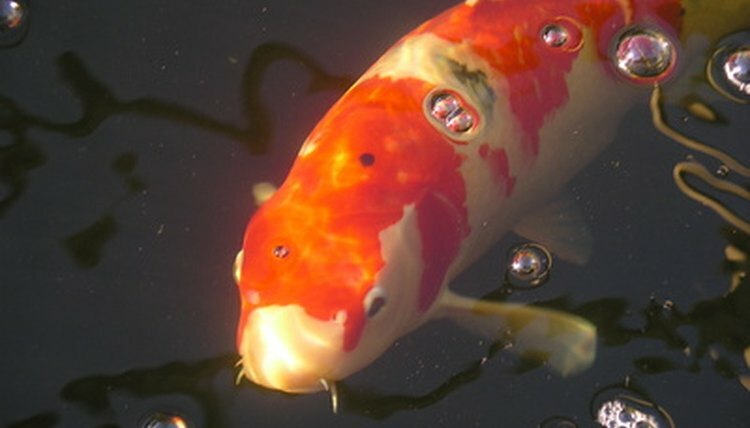 According to Pond Doc, the most common health problem your koi fish may encounter is parasites. The types of parasites you may encounter are numbered and while some of them can be seen with the naked eye, most cannot. Flukes are common parasites that bore small holes in your fish that make space for bacteria to enter. They cannot be seen with your own eyes. Generally flukes cause your fish to scratch themselves on objects in the pond. Anchor worms, which can be seen with your own eyes, are small stringy worm that attach to the side of your fish. If you try to remove the worm by pinching or pulling it, its body will disconnect leaving the head imbedded in the fishes flesh. According to Pet Education, ich is the most common disease that can affect fish in a tank and in pond. Physically, when the condition becomes advanced, your fish will develop small white flecks on their bodies and gills. You may also notice your fish are rubbing against rocks and plants in the pond since it can cause their skin to itch. Another common disease that affects koi is dropsy. Dropsy causes the body of your fish to swell up and their scales to protrude. The result is your fish will look like a pinecone. Although there are treatments for both ich and dropsy, depending on the stage of the disease you may not be able to save your fish. Water quality can impact your fish’s health as well. Bacteria in the water can turn ammonia to nitrates. Although nitrates are always present in your pond’s water, when the levels get too high the oxygen levels in the pond can decrease. Luckily, a water change and the addition of a salt treatment can usually protect your fish against nitrate poisoning. Another water quality problem is pH issues. Although the pH level of your pond will fluctuate throughout the day, when the pH drops drastically for any extended period of time your fish can die. The same is true for high pH. You can perform water changes to help with pH levels or try a commercial treatment available at your local pet supply store. Since koi fish breathe oxygen directly from the water, if the oxygen levels are low your fish will have trouble breathing and eventually suffocate. Adding an air pump or a fountain to your pound will help still ponds aerate the water, adding oxygen for your fish to breathe. Another option is to add plants to the water in conjunction with an aeration device. However, it is important to not rely directly on the plants for oxygen since they will deplete the oxygen levels in your pond when the sun is down and when there are lots of clouds. Algae are a common problem in ponds with lots of light. The easiest way to prevent algae growth is to limit the amount of direct sun your pond gets daily. Also, when you stock your pond, limit the number of fish to one inch of fish for every 10 gallons of water your pond holds. When you feed your fish, only feed them what they will eat in four to five minutes. This will eliminate excess nutrients in the water which algae can live on. Why Does Aquarium Water Turn Green if There Is No Algae in the Tank?